Congratulations to our nurse, Mercy who has been awarded Nurse of the Month for December. 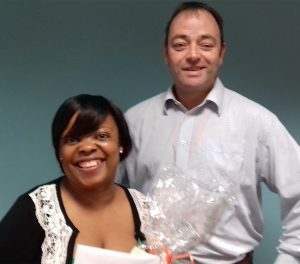 Mercy, who is registered with our Cardiff branch, was nominated for her reliability and enthusiasm. Sara Jones, Cardiff Branch Manager, said: “Mercy never lets us down. She is reliable, works at short notice and is requested for shifts all the time. Mercy was presented with a high street voucher, goodies and a card from the team.